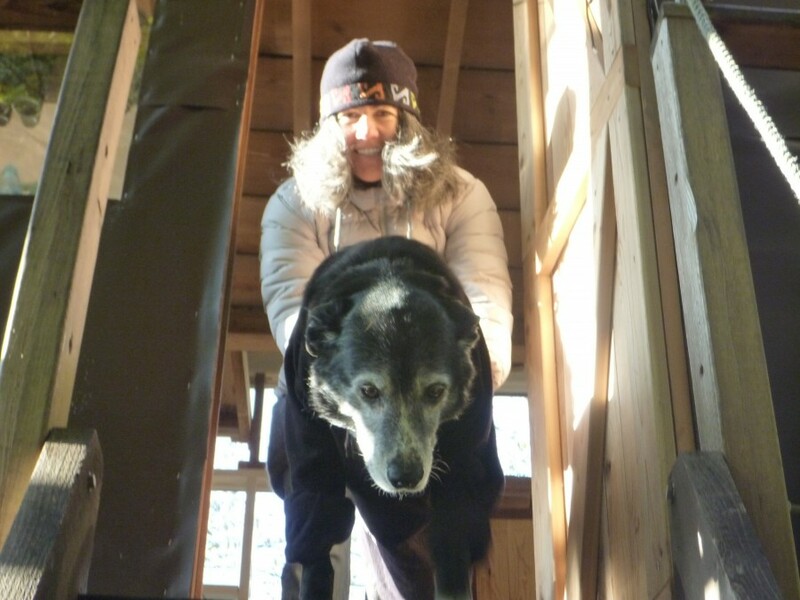 As some of you may know, in addition to sail design Patti and I also like to design and build kayaks. 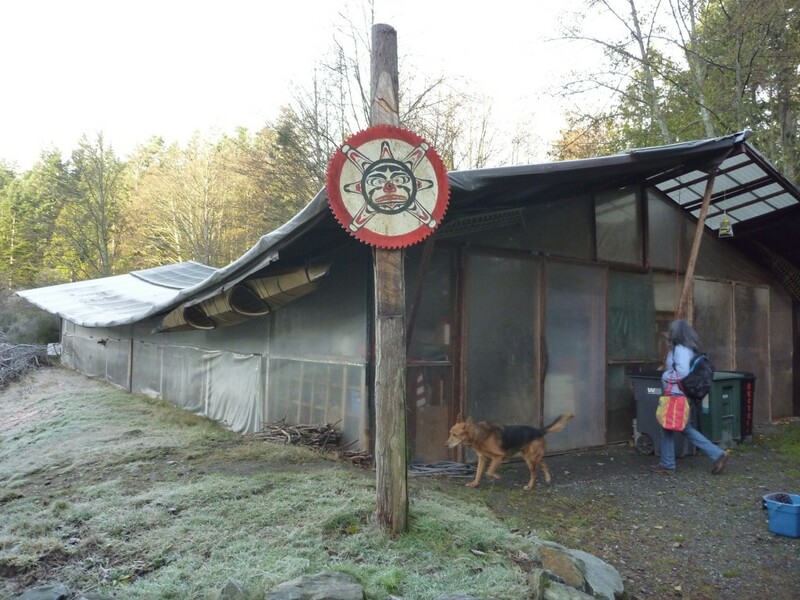 While waiting for our aluminum Kayaksailor parts to arrive, we decided to take a trip to beautiful Anacortes, Washington to visit our friend Corey at his traditional skin boat shop, The Skin Boat School. 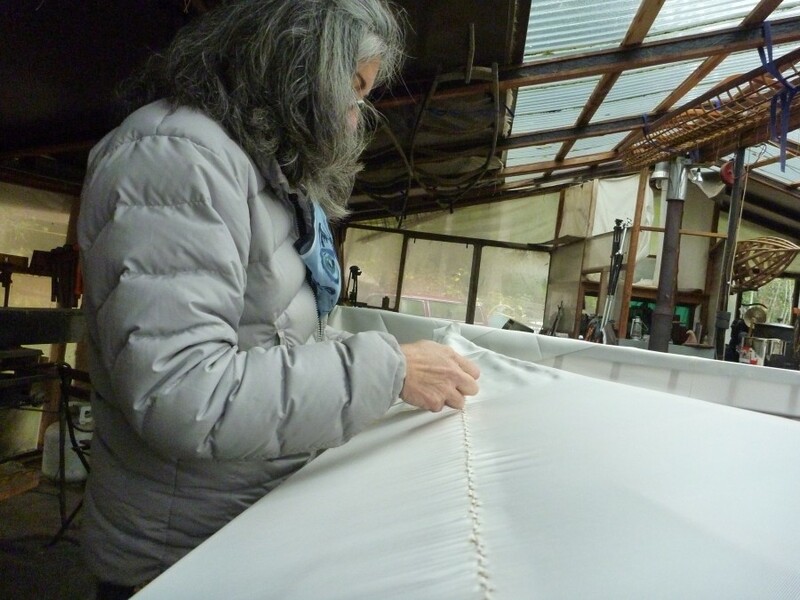 Patti wanted to reshape her boat by giving it more rocker, adding sheer and taking out some of the volume and I wanted to make mine a little less beamy and also take out some volume. We originally built these high volume boats for extended paddle-sailing trips but as it turns out, we use them mostly for day sailing. 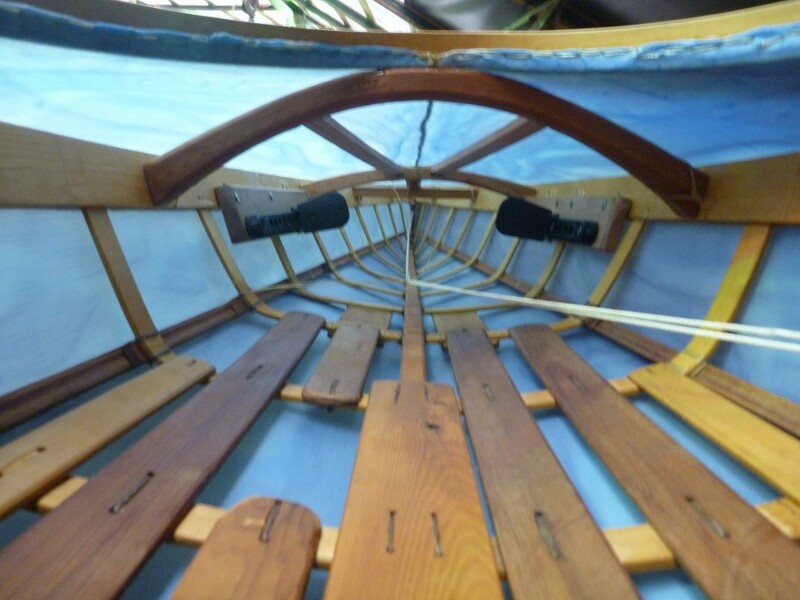 Building a skin-on-frame kayak or “qajaq” is the original, and some consider best, method of kayak building. Many think that this form of boat building has likely been practiced for several thousands of years. 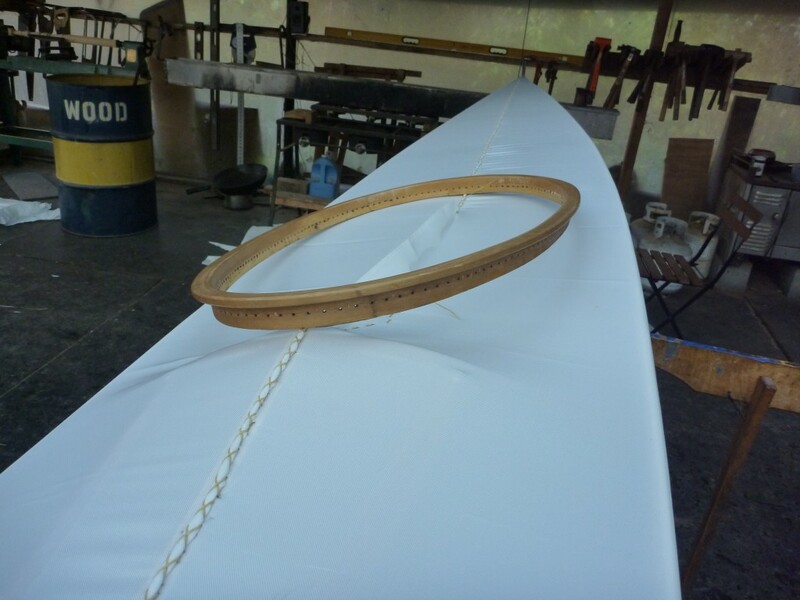 Our boats have urethane coated nylon for skin and waxed polyester twine for lashings. The Inuit peoples used seal skin and sinew, but aside from these differences, the basic building technique is remarkably similar. Skin boats are really cool. The Inuit craftsmen were very skilled and developed these incredibly sophisticated boats with limited resources. Not only was the qajaq an essential tool for the Inuit hunter, enabling them to bring food home in the extremely harsh environment of the far north, but the boats had a spiritual element to them as well. A qajaq is more than a boat. It can be viewed as an animal of sorts with a back bone, ribs and skin. 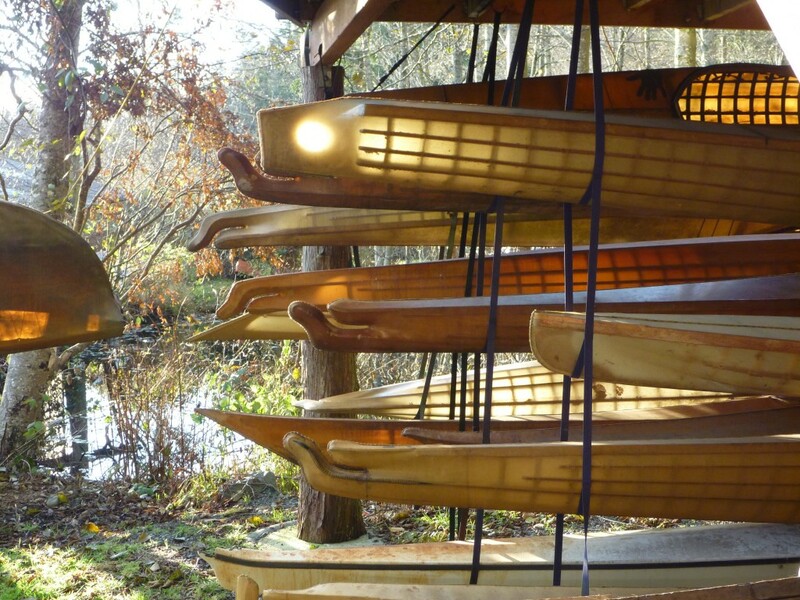 When the paddler, or paddle-sailor in our case, enters their boat, they become the spirit of the animal. Working together as one. The advantages of skin-on-frame boats are many, but probably one of the most alluring is the weight. A sixteen to seventeen foot boat can weigh as little as twenty five pounds! or about 11.3 Kg. Patti can pick up her boat with one hand. Try doing that with most modern plastic boat! On second thought, don’t try it. During our stay we lived in the school’s lovely skin-on-frame tree house. It’s a very peaceful and friendly place. At night we heard Coyotes jibbering and a pack of wolves howling on the distance. Corey says that the wolves belong to a neighbor who breeds them in captivity. He says they all are confined, but I have to say that the sound of a howling wolf pack is a powerful and a hair raising experience. I now understand the level of respect first peoples gave them. We think that we are on top of the food chain, Ha.! The first order of business was to peel off the skin. We used a heat gun to release the parts of the skin that were stuck to the frame. Next we cut the lashings and went to work removing and adjusting the ribs, trimming the gunwales, and repositioning the keelson to adjust the rocker. 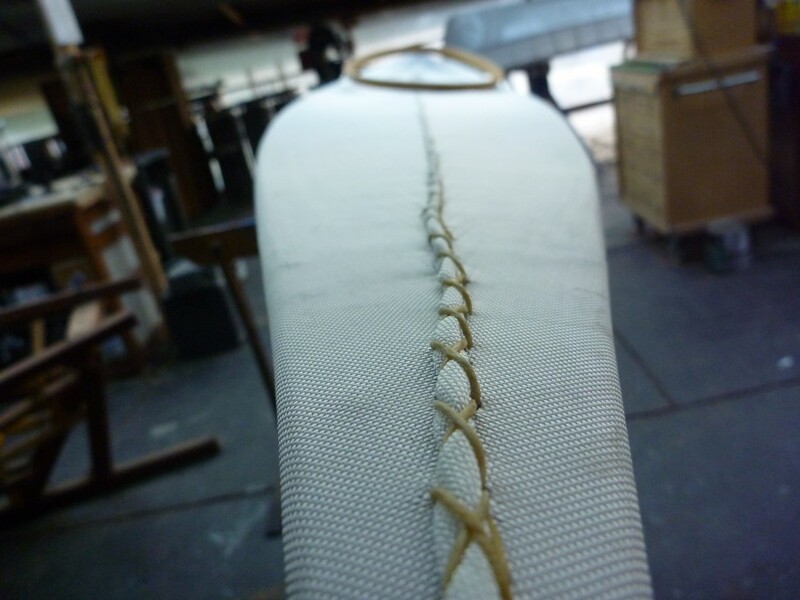 We shape our boats the traditional way, “by eye” and “feel”. I had to cut the deck beams on mine to reduce the boat’s beam. 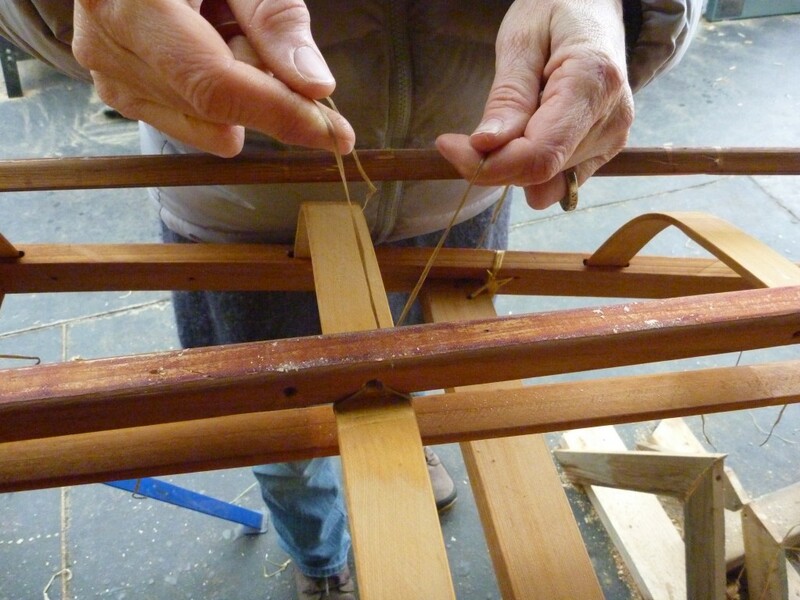 The frames are pegged and lashed together. No metal fasteners here, just artificial sinew and knots. Lots and lots of knots! At night it dropped below freezing a few times and Patti dressed our older companion Charlee-girl in her fleece shirt to stay warm. Charlee is looking down the stairs of the tree house trying to figure out a game plan to get down. She can still negotiate those stairs! 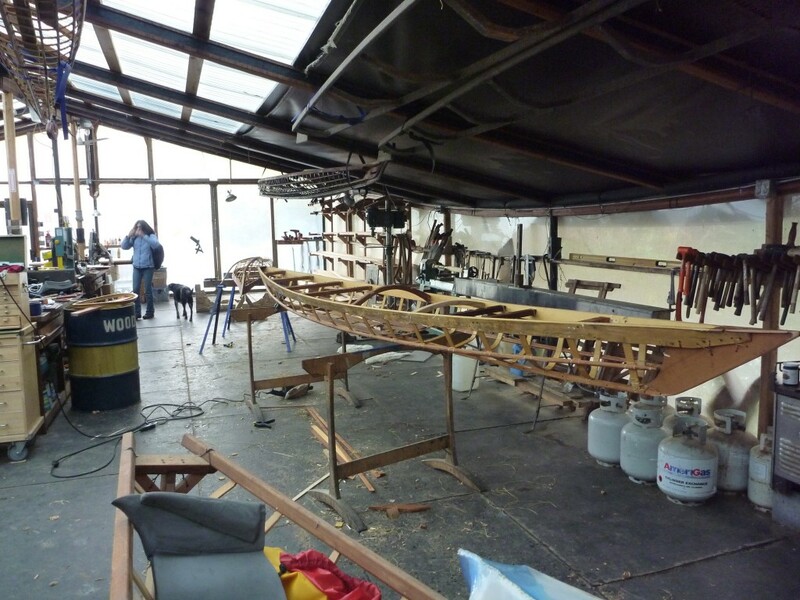 Once we finished reshaping the boats, it was time to put on the skin. Knowing when to stop tweaking the design of the frame is always a problem for me. I always want it to be perfect. It’s so easy to make a little adjustment here or there. I’ll just keep adjusting until Patti tells me to stop. We give each other balance. Sewing the skin is simultaneously tedious and therapeutic. It takes some practice to get a nice smooth, tight stitch. The Inuit would wet their seal skins while sewing but luckily we can work our cloth dry. Patti uses a beautiful more traditional Maligiaq stitch, while I use a rolled cross stitch. We put our heart and souls into all our creations, And with skin boats, a little blood at times. 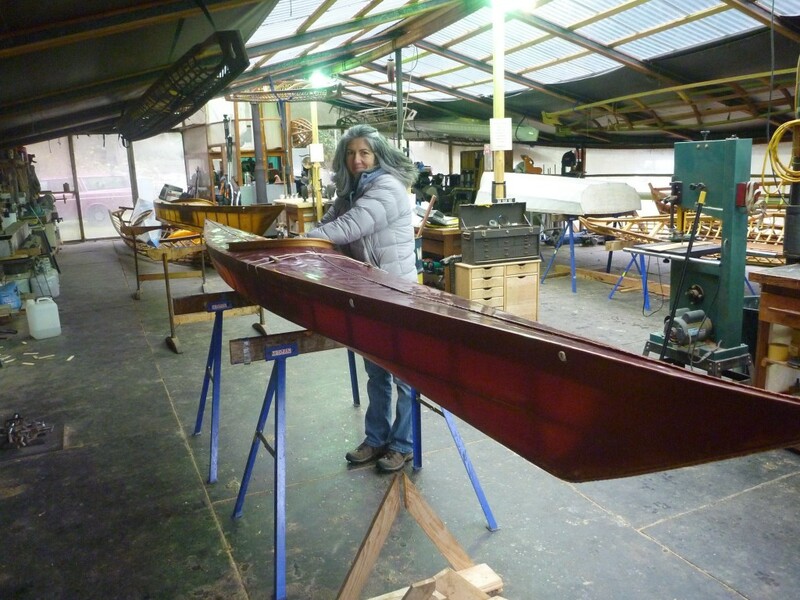 We chose to remove the rudder and change the stern shape of our boats. 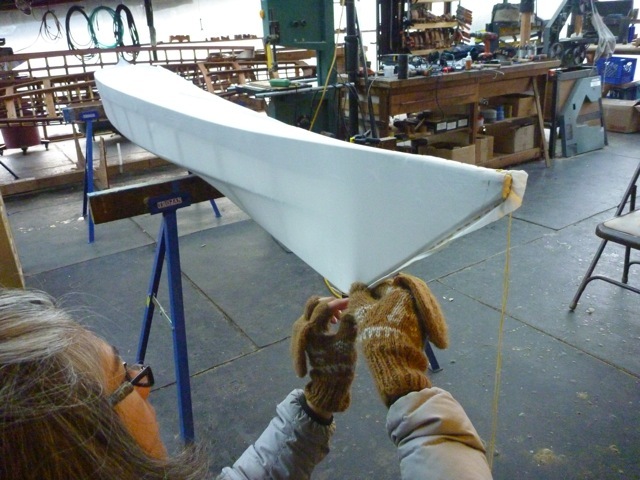 Since she purchased her Squamish, Patti has been getting back into rudderless sailing. I think that I will join her. It takes a little more skill, but that’s good, it’s all fun! Here the cockpit is waiting for attention. 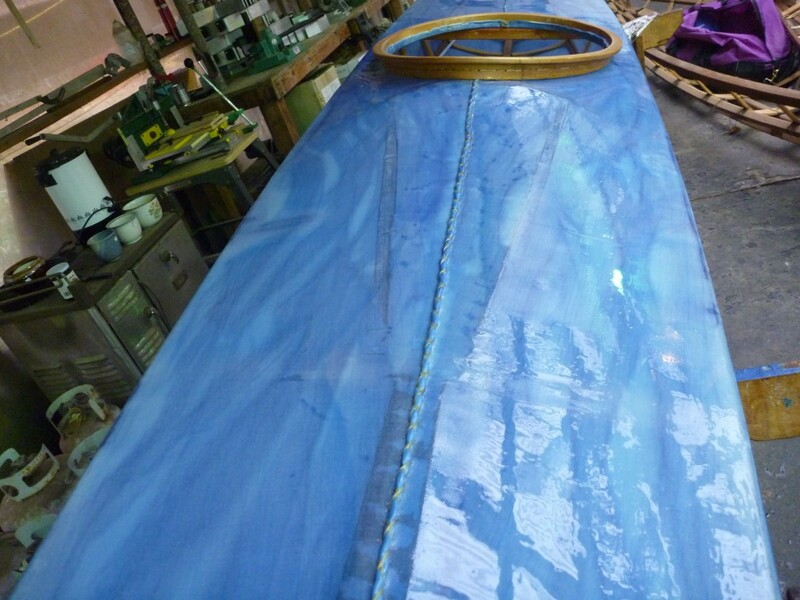 The coaming is the last thing to be sewn in place. The front rests in the curved masik and the rear rests on the flat deck beam. 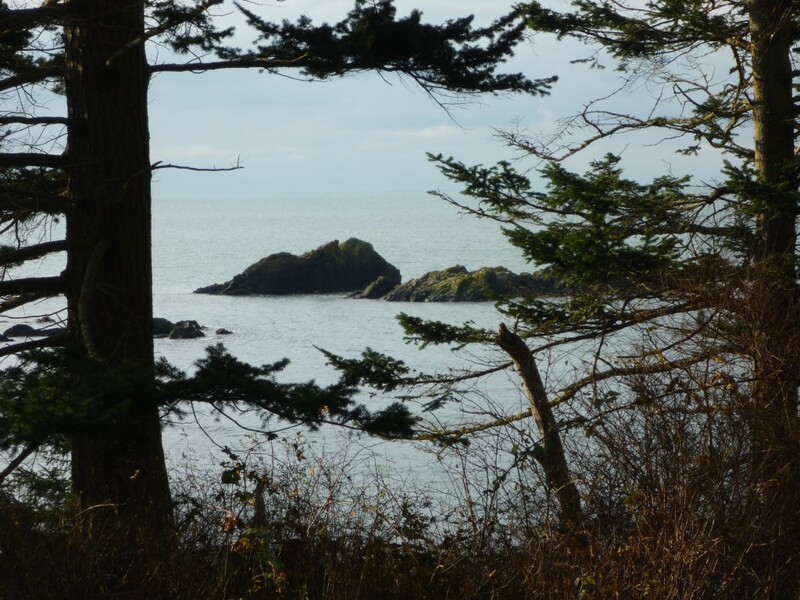 After work, we explored some of the shoreline of the Island of Fildago on which Anacortes resides. 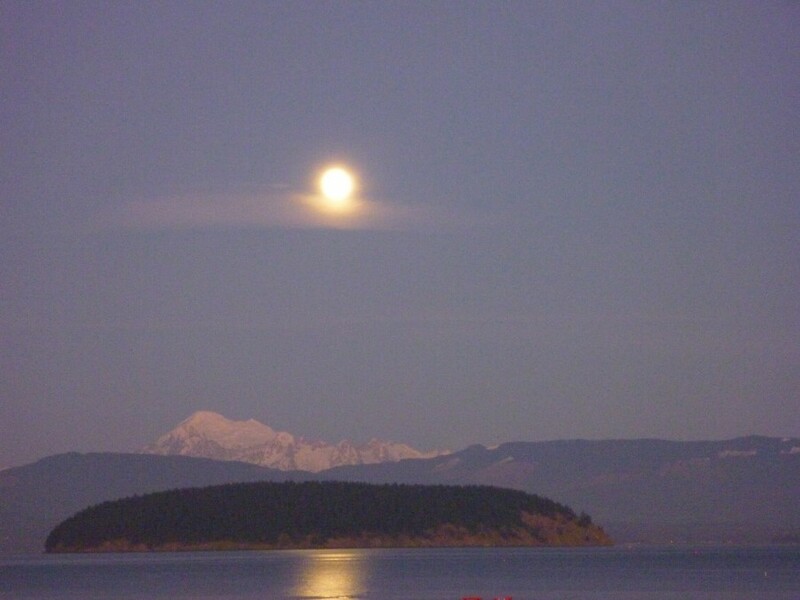 A glorious full moon illuminated the evening sky. This is a spectacular part of the world, and so many beautiful boats in the harbor! 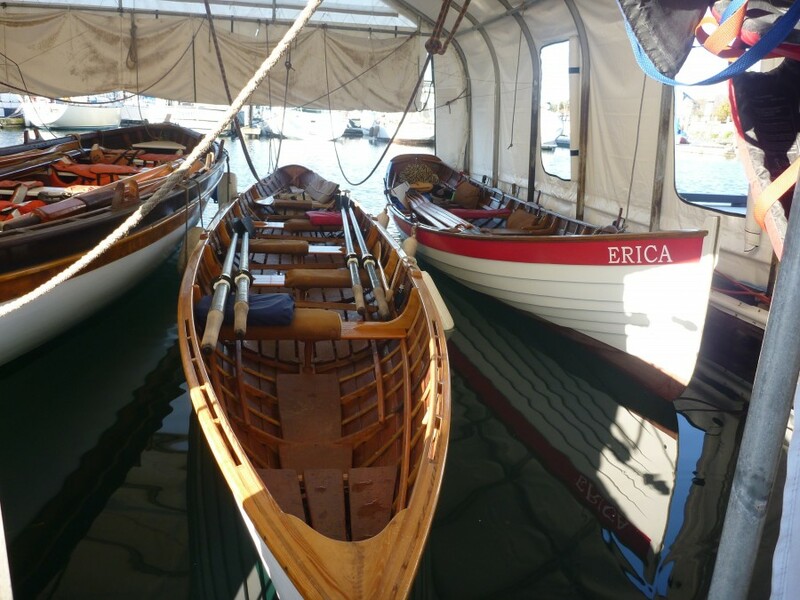 Below are some classic pulling boats we came across. I can’t resist admiring the sweet lines of a well designed hull. After the sewing was finished, we dyed and urethaned the skin. Here Patti shows her skills spreading the two part urethane “goop” with a spatula. It takes multiple thin coats and a steady hand to get that mirror shine. 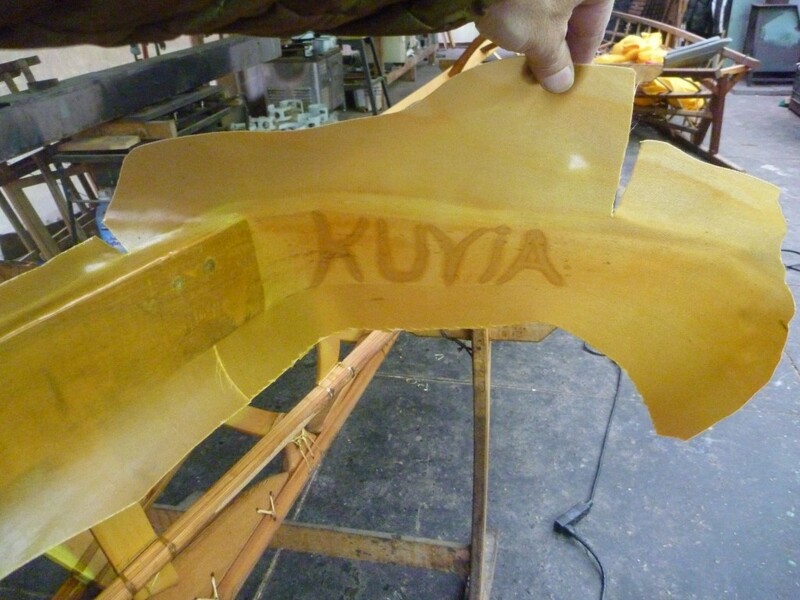 Most people use tan color dye to give their boat a traditional skin color. Patti and I like to take the path less traveled. We chose different colors for our boats. Paddle-sailing traditional skin-on-frames isn’t the norm either, but it sure is fun! The mix of the modern with the traditional brings something new. I painted a wavy blue dye design on my boat. 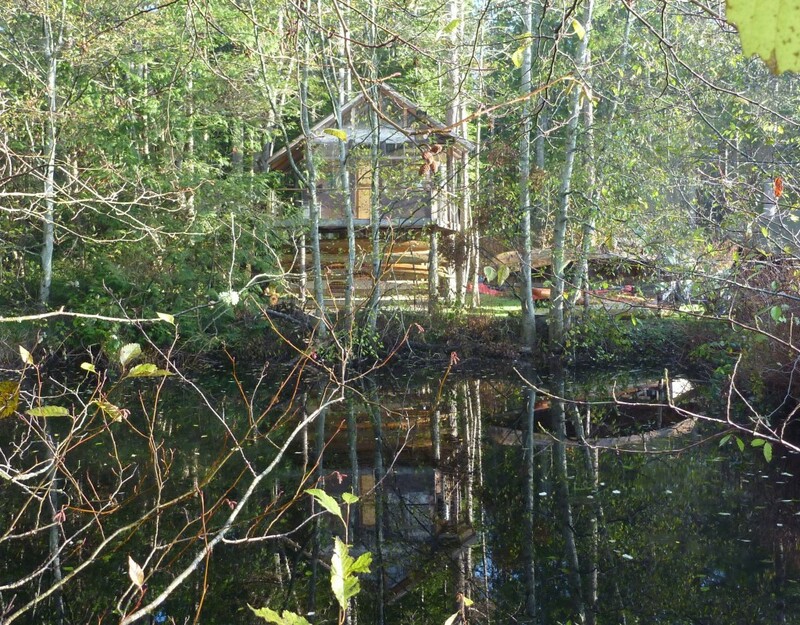 It won’t be easy to see on the water but it has a cool organic feel to it. Patti chose a beautiful blue green. Her boat has feminine curves that are pleasant to the eye. This shot shows the results of Patti’s remarkably smooth urethane finishing job. I always like the view from inside the cockpit. The white cord seen running fore and aft goes through a primitive pulley in the bow and is used to pull the forward float bag into position. The only metal hardware used in the boat are the stainless screws that hold the adjustable foot pegs in position. 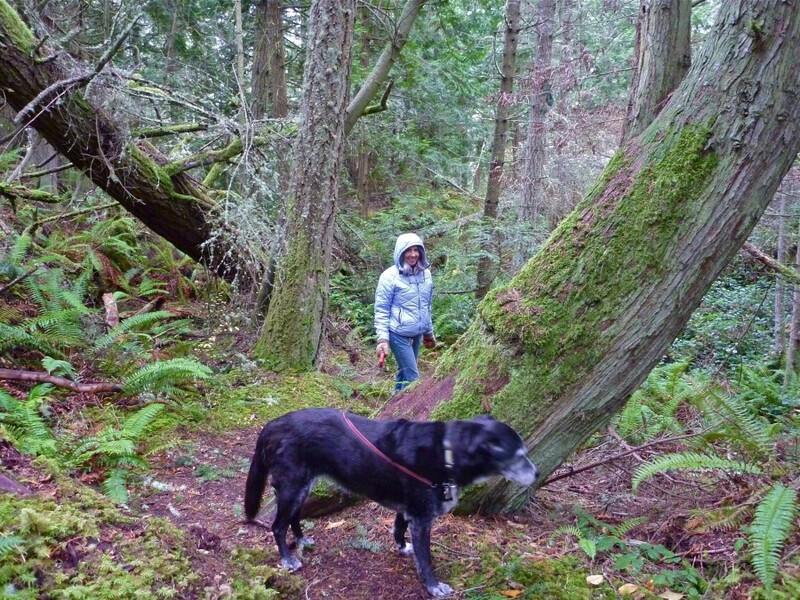 While the urethane cured, we went hiking on a beautiful trail about ten minutes from the shop. The rain forest is a remarkable place to explore. Lots of rain and lots of life! Even in winter the amount and variety of vegetation is warming to the soul. It’s easy to feel connected to the environment here. The humidity holds the sweet organic aroma in the air. We need to come back here and sail this coastline. There are so many cool places to explore. Deception pass is just around the corner. Even though the tidal current rips at times, our sails can definitely help fight it in case we miscalculate a tidal change. 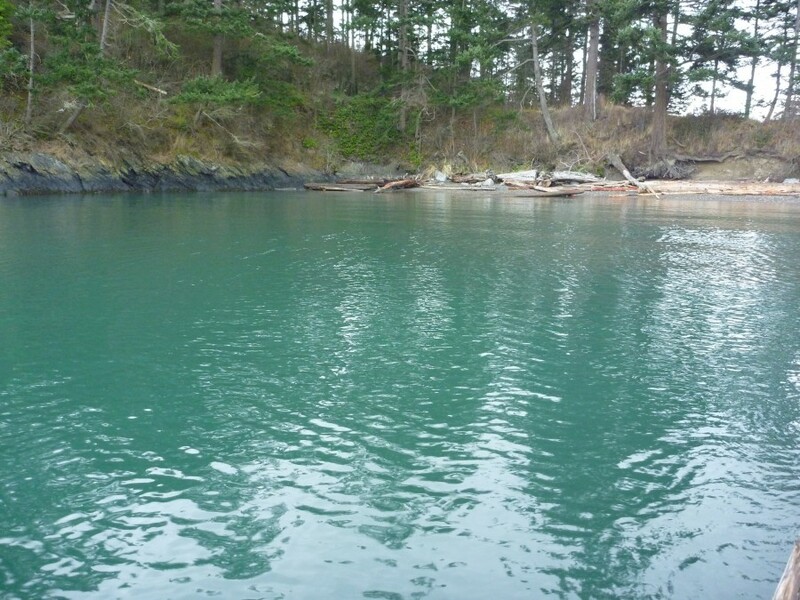 The water is very clear and stays at a nearly constant 8.8 to 11.3 degrees Celsius (48-51 Fahrenheit) year round. It’s cold but definitely doable with proper thermal protection. A short distance away is Rosario beach. 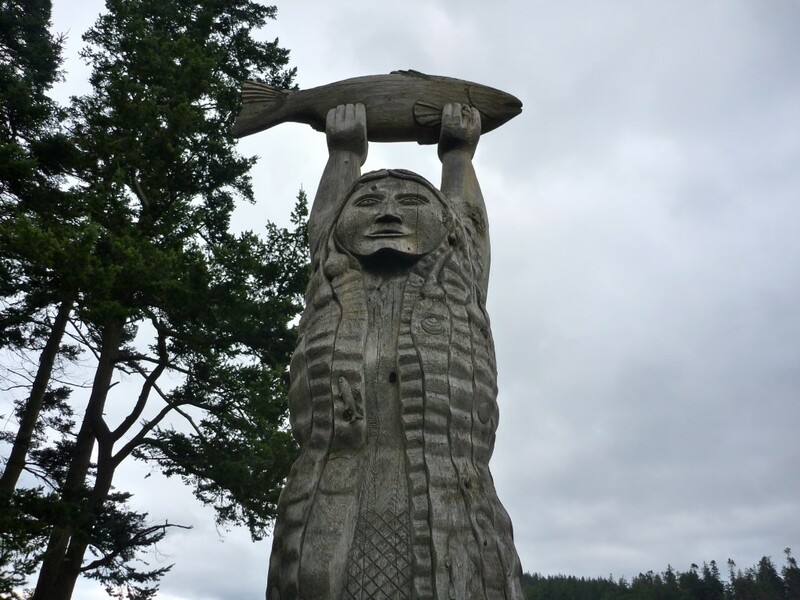 A pole sculpture depicts the spirit of Ko-Kwal-alwoot, “The Maiden of Deception Pass”. If you want to learn her story, e-mail me and I will gladly send it to you. 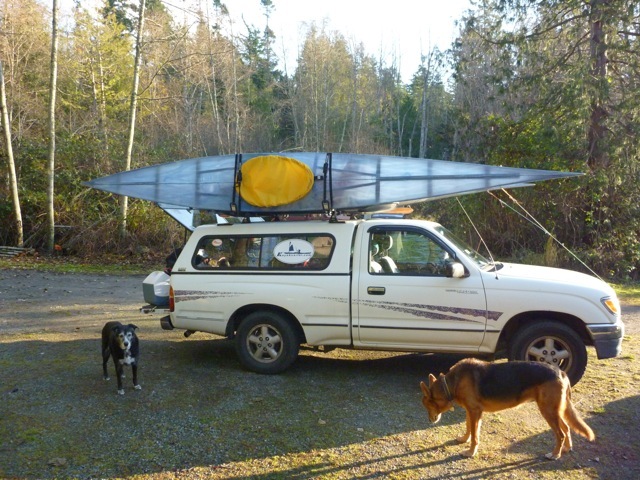 When we arrived back from the hike, the urethane was cured enough for us to strap the boats to our trusty pickup so we could start the five hour drive south to Hood River. 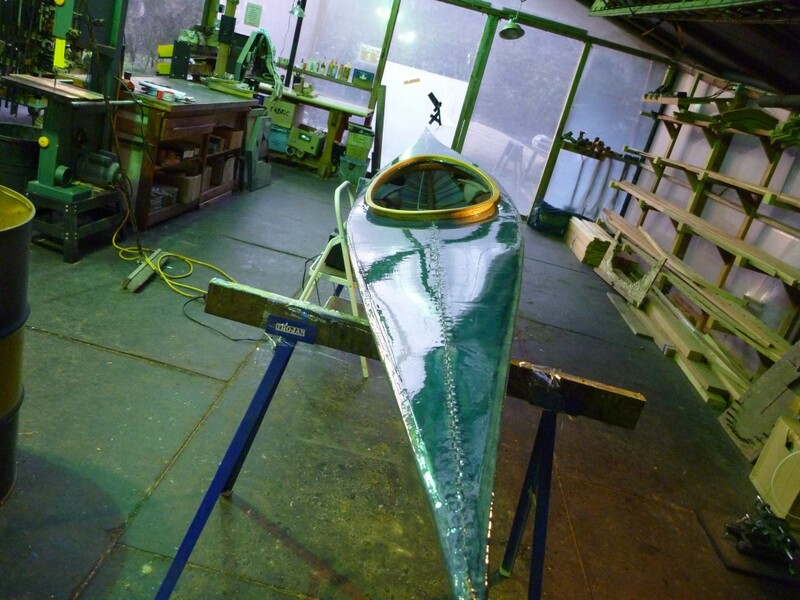 We love how the light shines through the hulls giving them a stained glass appearance. In this shot you can see the swedeform shape of my hull with the cockpit positioned aft of center. 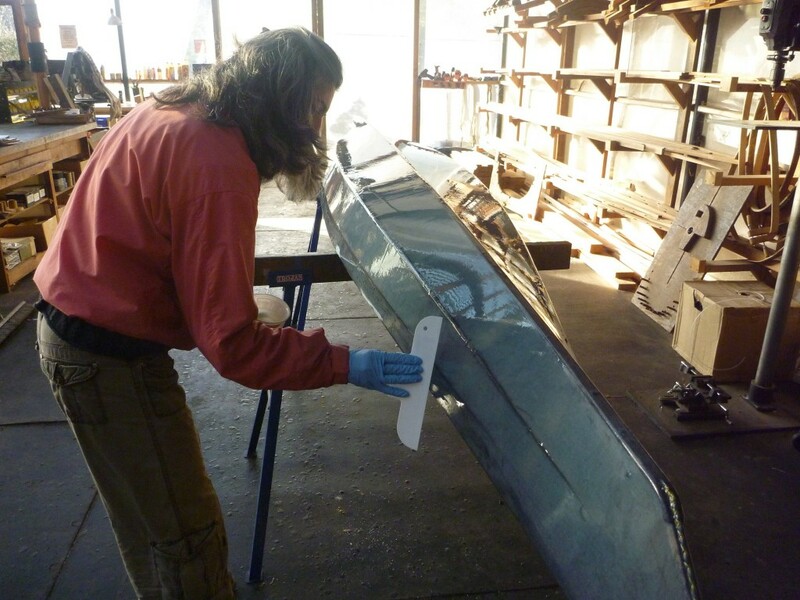 Also visible is the center foredeck stringer on which the Kayaksailor main body tube will rest. Thank you so much for taking time to read this post. If you haven’t already done so, please consider subscribing to this blog in the right hand column. Also, please feel free to comment! Great.Beautiful place． Kayak was born from your precious fingers would fly over the lake with incredible speed. Thank you for the wonderful comment Yutaka-san. We will carry your kind words with us. I am new to your blog, and I find your post informative with an uplifting spiritual twist. This post was very interesting; relating the modern use of materials to that of the originators of this craft. Skin-on-frame boats have a special place in our hearts. As soon as it slows down here a bit, I will take some time to update the blog. 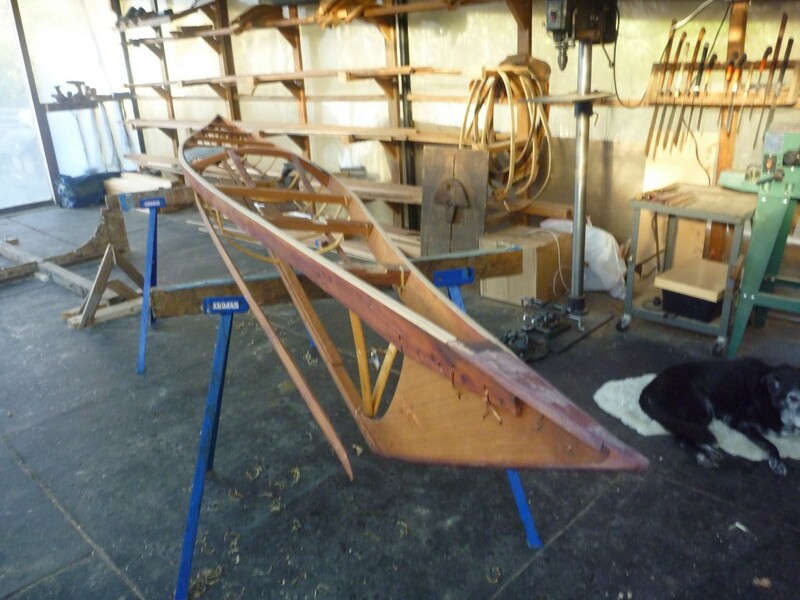 Just stumbled across this post but so pleased I did…..currently have plastic yaks but when I was a teenager I had a canvas on frame boat which I built with a friend. 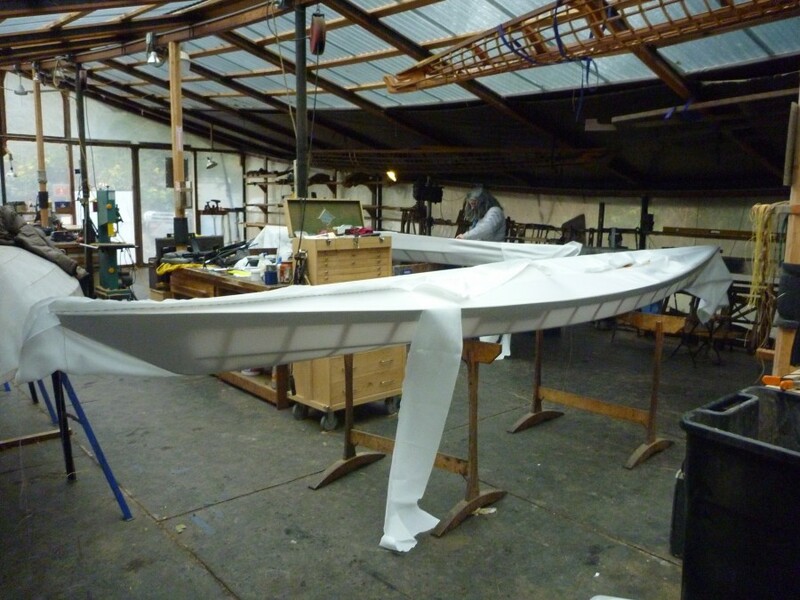 We got the plans out of an English magazine, the boat was 14’6″ long x 2′ wide. The frame was laminated white pine ribs on stringers. It was a beauty. So much space inside to get camping gear stowed, light and easily paddled. Groan… That was in 1964. The only problem with the canvas was that it was a bit fragile and would get ripped by underwater branches…. The technique you have here with urethaned nylon looks fascinating I would love to know more. Thanks so much for your comment! Skin-on-frame boats will always have a special place in our hearts. They posses a primal beauty, as well as being very functional craft. The material for skinning, as with most things, has advantages and disadvantages. The nice thing about canvas is that it’s mostly biodegradable. The downside, as you pointed out, is that it can be somewhat vulnerable to punctures. Plus, it can also be a little heavier than many synthetics. I am considering looking into hemp cloth the next time my boat needs a re-skin. It’s a stronger than cotton and has a long history of use in the marine industry. This last time we used ballistic nylon. It’s light weight, strong, and stretches sufficiently enough to reduce small punctures. The downside, is that nylon is hydrophylic (absorbs water) and therefore stretches slightly when it becomes wet. The result is that the skin appears tight as a drum on land when the air is dry, and looks a bit wrinkly when in the water and on land in humid conditions. 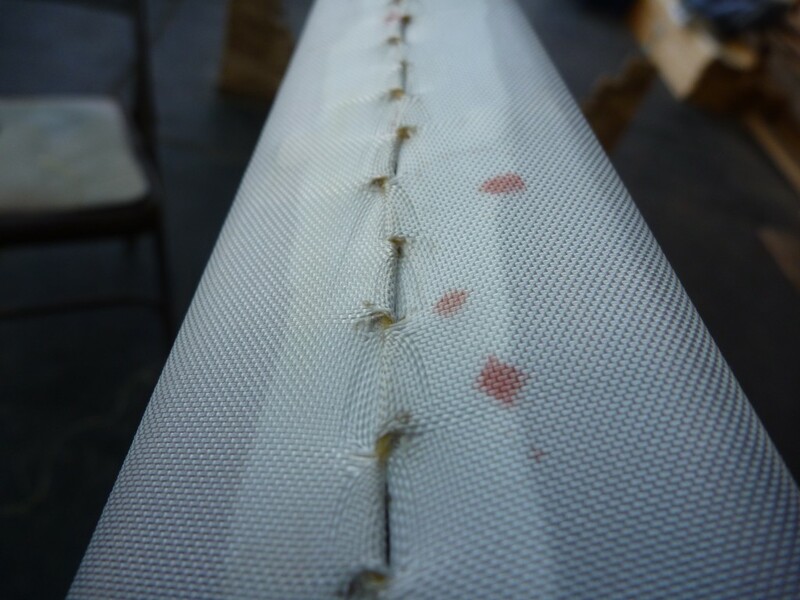 This is why it’s best to skin nylon boats on cool damp days. Not a problem here in the Pacific Northwest!